The absolutely gorgeous always Josefa has started a new monthly link-up called Conversations over Coffee and each month she will have a theme. This month's theme is Conversations with My First Love. I could have written a post about reading, as I knew that is probably my earliest love. Or photography, another first love. But my first true love? My first true love would have to be Dave. My first true love and the love of my life. Because I've been unwell the last few days I haven't really had time to sit and write a proper post to go with the theme so I am going to re-post something I wrote for our anniversary back in August last year. ...I started dating the man I was destined to marry. 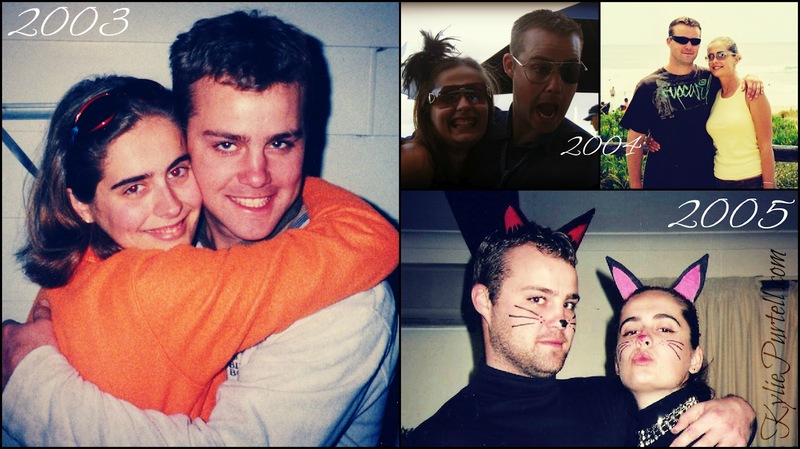 The first pic on the left is one of the earliest pics I have of the two of us. The bottom right one he'll probable won't be too happy about me posting! Lol! We've been together for 10 years. One third of my life. Never would have guessed this 10 years ago! I can't imagine what my life would be like now if I hadn't been introduced to Dave all those years ago, on July 19th 2002. If he hadn't finally gotten the guts to get my number and call me. Sometimes it's hard to comprehend all that has happened in the last 10 years. We're parents for heaven's sake! And I don't want to imagine what life would be like. I am seriously one of the luckiest women in the world to have found a man who is so good to me. He puts up with my crap. He looks out for me. He cooks dinner for me almost every night. He often does my washing for me. He may not be big on the romantic side of things, but it's the little things he does that prove his love for me time and time again. A love I often don't deserve. A love I've taken for granted on occasion. A love I've abused and treated poorly. But even after I've treated him badly there is still that love. Through all the good times and the bad, we've stuck together. We've been honest with each other. But most of all we've accepted each other and supported each other, no matter what. I am so lucky. The luckiest. I love you Mr.P, with all my heart and soul, and I can't wait to spend the next decade and beyond together. For me, I think the key to our lasting relationship has been learning to let go of the anger, the hurts, the petty disagreements. Acceptance and a sense of humour. Support. What do you think is the secret to a lasting relationship? 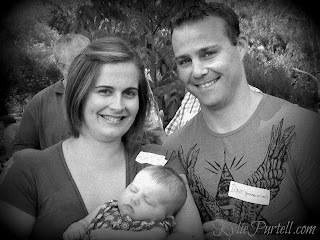 Gorgeous memories Kylie - what a beautiful journey to share - the secret to a lasting relationship? So gorgeous Kylie, you too are so cute together, esp in those early photos! And I love your wedding pics. One of my early loves was photography too. We'll be celebrating our 10th anniversary together this March too ;) Really such a blessing to be able to be with someone you love, and loves you back so. Oh gosh a sense of humour! That's all I've got sometimes! It's totally the best. What a lovely love story Kylie. You are such a gorgeous couple! 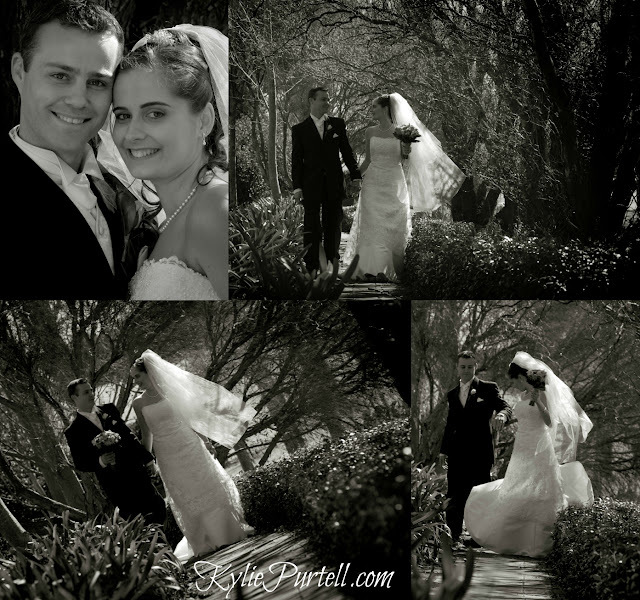 Love that you married and signed the contract on your dating anniversary. Hope you feel better soon. I'm like you Kylie - I have meet my soul mate - and PHEW - thank goodness that there is someone out there that loves me for me! I lost this post - and our timelines are very similar, except we had 3 children in 3.5 years - WOW. Great posts and awesome photos! Em @ Have a laugh on me! What a beautiful post Kylie! You make a beautiful couple!